As Chairman of a Department of Medicine for 26 years, the author has observed the interactions between physical and mental illness in patients frequently. These have occurred in times of environmental and professional stresses. A realization that United States Presidents have had mental and/or physical illnesses at critical times during their administration is very important for our country. 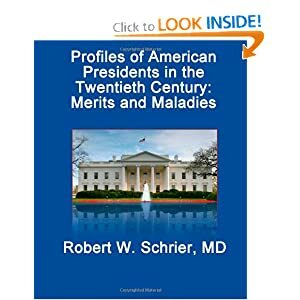 This book, "Profiles of American Presidents in the Twentieth Century: Merits and Maladies", discusses these issues relating to all 17 U.S. Presidents in the twentieth century when over 70 million people died in military conflicts. The past failure to use the 25th amendment in such times of crises has implications for the future of the country. In addition to the text, there are over 120 pictures in the book. See below for highlights of issues about each 20th century President! I have read quite a few books on the American Presidents in the past, so when I saw this book I was interested to see what it had in store and whether it would illuminate anything further than some of the other books than I had read in the past. What I was interested in was that it was not written by a person with multiple degrees in History, but instead by a person who has an interest in the field and who is using his background as a doctor to look at Presidents in a different light as he feels that the health of many of our 20th Century Presidents has drastically impacted our country in many ways that you would not normally expect. What I like about this book was that it does not talk above the reader, and instead it uses language that all can understand and is very straight forward in its points about the Presidents. This book is an amazing look at our Presidents and how their health may or may not have effected their judgement as President. I truly enjoyed it and found it to be a fresh look at our Presidents. I highly recommend this book!